This content was extracted from Barney Oldfield's personal scrapbook. Included are two articles from daily newspapers, although the source was snipped from the clipping. Both were published on November 12, 1914. Unfortunately, neither article is complete. However, both contain interesting information about the finish of the 696 mile race. Bill Bramlette, driver of the number 19 Cadillac that finished fifth, drove the final few miles with a broken steering arm. He and his mechanic steered the car by lashing wooden fence rails to the front axle and using them as giant levers. Imagine what a strange sight that must have been. 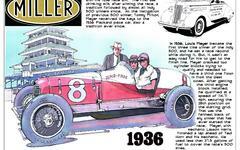 Reportedly, the throng of people lining the course leading into Phoenix did not recognize Oldfield as both he and his Stutz racer - the same one he drove to fifth place at that year's Indianapolis 500 - were coated with mud. His trademark cigar stub had become the tobacco filing to lump of dirt.